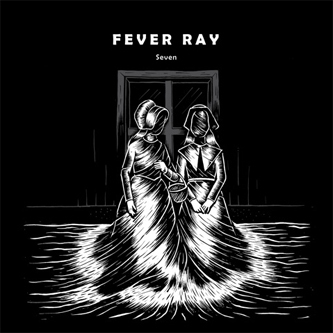 Karin Dreijer Andersson's Fever Ray project continues to bloom dark flowers in the form of another set of re-interpretations from Marcel Dettmann, Martyn, CSS and Crookers taking album highlight 'Seven' in four very different directions. If you've heard the album, you may well know this track as the one with the "...we talk about love/we talk about dishwasher tablets..." lyric, or by it's spine gripping key changes, either way you'll probably recognise its brilliance. By far the most faithful, and in turn successful of the versions is from Martyn, the only remixer here to use much of the vocal and original melody, while completely giving it his own spin with a maximised garage rhythm sounding like he's been taking notes from Zomby and Artwork. Dettmann's mix intriguingly gives Karin's vocals a very masculine slant, lowering the pitch to match his dryly funky techno mix, while Crookers show an influence from UKF rhythm syncopations with a party rousing mix and Css take it to the disco with additional 80's electro keyboards and a pout of sexed-up flavour. Very very strong twelve, especially that Martyn mix which is just incredible. A must-have!